The list of online slots with Ancient Egypt as their theme is a long and ever-extending one; we’re not sure what the reason is behind their enduring popularity but of course we play them nonetheless. Queen Of The Pyramids is a Playtech release and it’s probably fair to say it’s not at the top of the tree when it comes to quality but it does have two bonus features and a progressive jackpot so read on for more information. 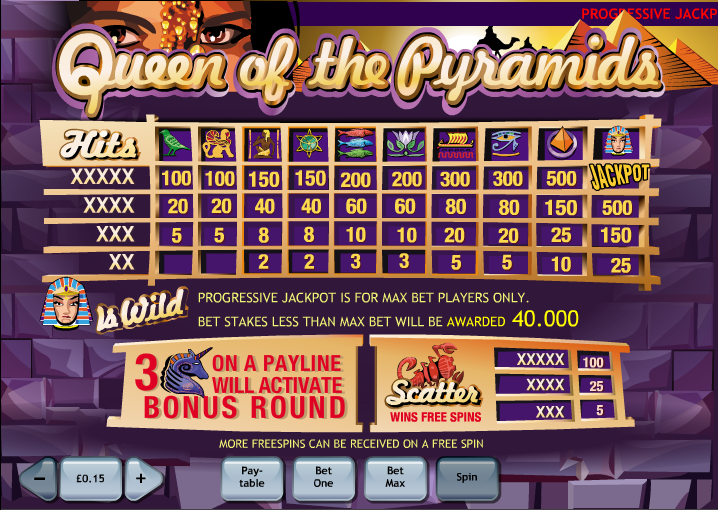 Queen Of The Pyramids is a five reel slot with three rows and nine paylines; pyramids and silhouetted camels can be seen behind those reels while the queen (Cleopatra?) watches over proceedings in the top left hand corner. If you’ve played any other Egyptian-themed games then the symbols will be recognisable; various hieroglyphic representations of Egyptian gods are included here along with other familiar icons such as the Pharaoh and the Sphinx. The Pharaoh is the wild symbol, the bonus icon is the blue unicorn thing and the scorpion is the scatter. The free spins also activates the Super Payout mode which essentially means that all your wins will be multiplied by 5x. More free spins, the bonus round and the progressive jackpot can be won from this feature. This min-game is triggered by landing three or more on an active payline; a Bonus Wheel will then be spun which will result in a multiplier of your line bet. If this round is triggered from within the free spins it will also be multiplied by 5x. 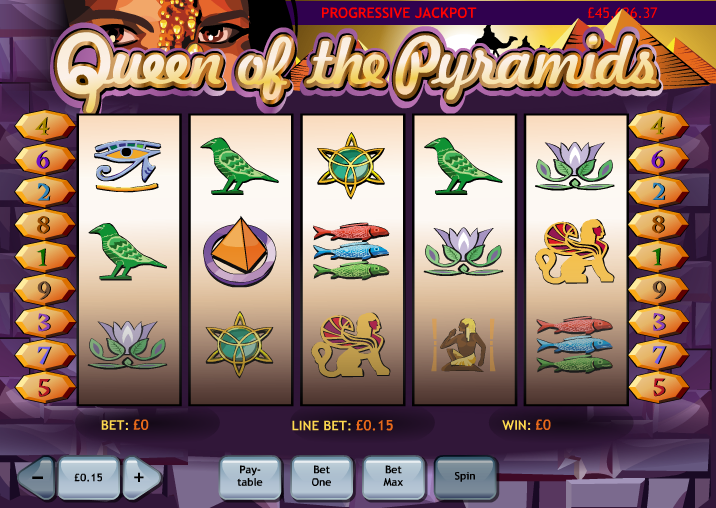 You’ve probably noticed the progressive jackpot total scrolling across the top of the screen; this is won by landing five Pharaoh symbols on a winning payline. You must be playing the maximum bet level of £0.25 per line to be eligible to win the big bucks. All we can say is make sure you are playing the maximum bet level to qualify for the progressive jackpot. Your RTP also increases to 94.97% from 93.97% using the max bet. This slot is a little dated now as you can see from the graphics but it’s rescued from ignominy by two bonus games and the progressive jackpot – worth a go.